So...this recipe takes a little longer on the freezer prep side than all of our other recipes. 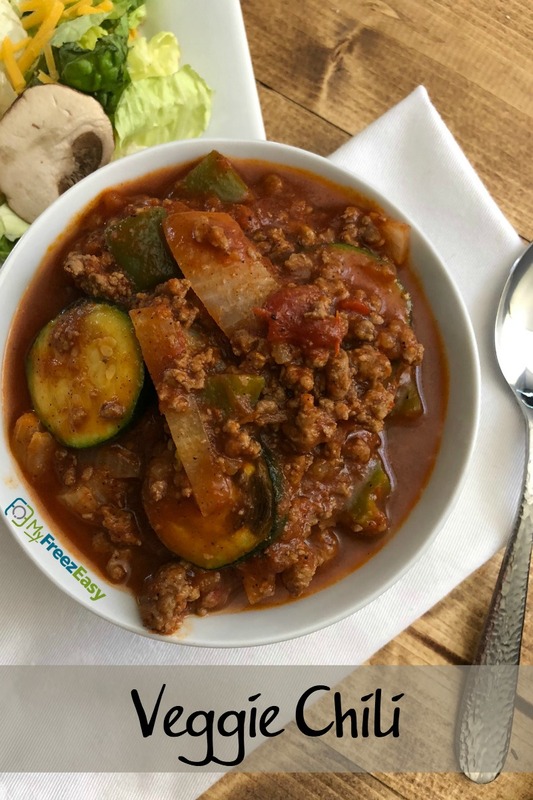 But it’s so delicious and getting a little of that flavor from the veggies roasting and caramelizing into the chili is so worth the extra few minutes! Enjoy! Preheat oven to 425 F. Spray baking sheet with non-stick cooking spray. Seed and dice the green bell pepper. Dice the onion. Slice the eggplant and zucchini both into 1/2-inch circles. Place the diced veggies onto prepared baking sheet and roast in the oven for 15 to 20 minutes. In a large saucepan, brown the ground beef with the minced onion and garlic powder. Drain and return to saucepan. Stir in the crushed tomatoes, chili powder and saute for 5 minutes. Stir in the beef broth and let simmer for 10 minutes to allow the flavors to mingle. Once the veggies are roasted, add to the chili and cook another 10 minutes, or until veggies are softened. Season with salt and pepper to taste. 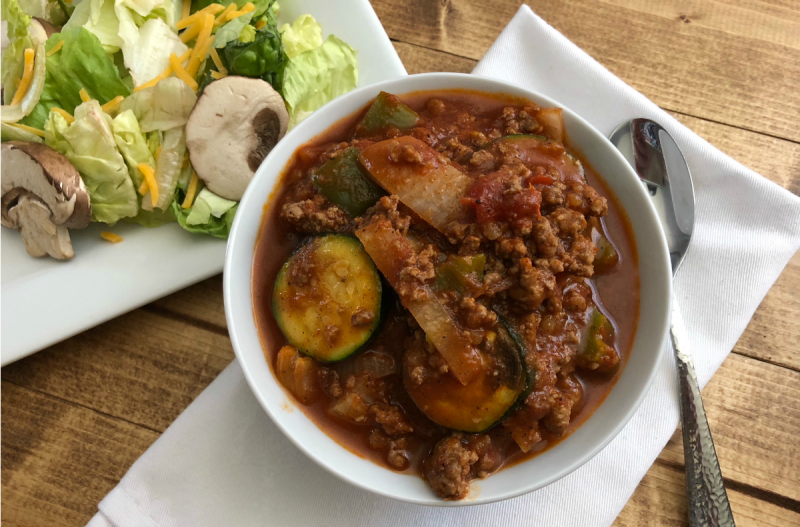 Serve Roasted Vegetable Chili with salad. Slice 2 eggplants and 2 zucchini, both into 1/2-inch circles. Seed and dice 2 green bell peppers. Dice 2 onions. Recipe is dairy-free when omit the shredded cheese garnish. Thaw and add contents of baggie to large saucepan or Dutch oven. Bring to bubbling and cook for 20 minutes. Garnish with shredded cheddar cheese.